A firewall is a dedicated appliance, or software running on a computer which inspects the network traffic passing through it, and denies or permits passage based on a set of rules set by the network administrator. It is normaly placed between the protected network and the I.S.P modem and acts like a gate that protects assests to ensure nothign private goes out of the network and nothing malicous comes in. 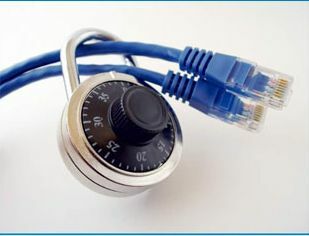 A firewalls's function within a network is a similiar to a physical firewall with fire doors in building construction. In the former case, it is used to prevent network intrusion to the private network. In the latter case, it is intended to contain and delay structural fire from spreading to the adjacent structures. 1) LImited to ONE public IP Address on the "outside" of the device. We Install a hardware based firewall system that will completely shield you from any potential intrusion into yoru home network. These types of intrusion often lead to identity theft, personal information being sold for profit, and added worries to your household or business. Not to mention the valuable time you invest into trying to rectify the Irreversiable damage that has been done by these culprits. With our firewall solution this will assure you that you have the very best possable protection that you can get from our Industry leading software and hardware combination. Leaving the ending result of peace of mind and the added protection from internet would be hackers!! !